Elvis Presley Signed RCA "Nipper" Statue for MGM! An extraordinary piece that ties together the film and music career of The King himself, presented here is a 20" tall resin statue of Nipper the RCA dog, boldly signed by Elvis to the staff of the MGM Pictures press department in black ink, "To Mr. Howard Strickland and all the boys in the Press Department, Gratefully, Elvis Presley." A superb signature from Elvis, certainly one of the nicest and largest examples we have ever seen! Originally acquired from the estate of Howard Strickland, who was head of MGM's public relations department during Elvis' tenure with the studio. Some light signs of professional restoration, nearly unnoticeable, do not affect the writing and signature or statue's overall appearance whatsoever. 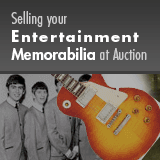 An exceptional display and ideal investment piece for the ultimate Elvis collector! From The Tom Fontaine Music Memorabilia Collection.